Have you ever cringed a little bit when you saw someone accidentally scratch the paint on their car? Maybe you stood on the sidelines and watched helplessly as your friend went to remove a nail from the wall, only to take out a solid 3” of drywall when the nail wouldn’t budge. Mistakes happen, and hey, we’re human, so accidents will occur whether or not we want them to. However, when a professional service like roof moss removal is concerned, the last thing you want is for someone to damage your roof. We Steer Clear of Aggressive Brushing. Here’s Why! That’s why RoofMoss.com, the trusted source for roof moss removal in Seattle, only uses harmless but 100 percent effective methods to ensure that the moss on your roof takes a hike. 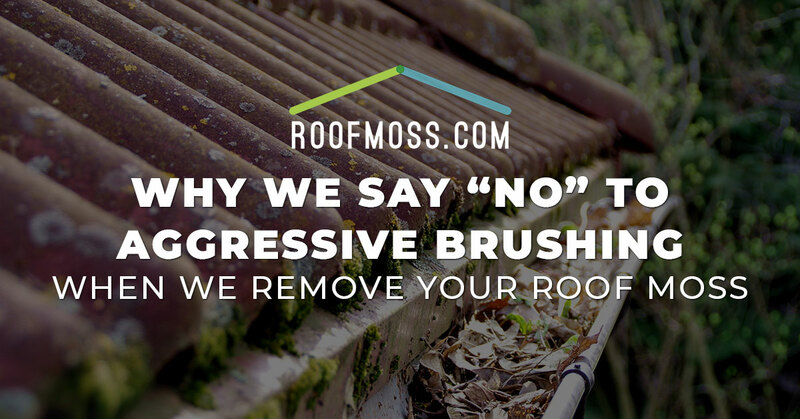 Due to the fact that our team has, sadly, seen many perfectly fine roofs damaged by aggressive brushing techniques, today’s blog post will briefly detail why aggressive brushing techniques are bad when removing the moss on your roof, and what RoofMoss.com does in place of this ineffective method. Feel free to check out our signature treatment process at any time by visiting here. Even worse than abrasive roof scrubbing is pressure washing. This practice is known to literally blast weakened roof shingles right off of a roof’s surface, or in a less worst case scenario, at least damage the shingles to the point of where they need to be replaced. Instead of a high-pressure wash, our team of roof moss removal experts utilizes a unique low-pressure wash solution with biodegradable components. This is roughly the same amount of pressure as your standard garden house, so you’ll never have to worry about your roof being damaged. Brushing and scrubbing the surface or your roof can lead to the same damage as using a high-pressure washer. Even something as simple as walking on your roof can wear out the materials, let alone subjecting the surface to harsh metal bristles on a brush. Yikes. With the help of our state-of-the-art biodegradable solution paired with our low-pressure wash, you can rest easy knowing that the pesky moss on your roof will be 100 percent removed, all while preventing future moss growth from occurring and ensuring that your roof isn’t harmed in any way, shape, or form. Not all roofs are created equal, though many of them are similar if not completely identical. While mild scrubbing may be appropriate for roofs without shingles, other older roofs with shingles generally require a greater level of sensitivity when removing the moss on the surface. Naturally, our roof moss removal team will work with you to identify your roof type and approach the job with the best techniques in mind — none of which involve damaging your roof! Get an Instant Estimate from RoofMoss.com Today! Don’t let moss eat away at your roof. Instead, call the professionals who skip aggressive brushing and won’t damage your roof, all while effectively removing the moss on top of it. Get an estimate from RoofMoss.com today.